MERRITT ISLAND, Florida -- Space shuttle Endeavour, mounted atop NASA's modified 747 Shuttle Carrier Aircraft (SCA), will make the final ferry flight of the Space Shuttle Program era when it departs Monday, September 17, from NASA's Kennedy Space Center in Florida headed to Los Angeles International Airport (LAX). On Oct. 11, 2011, NASA transferred title and ownership of Space shuttle Endeavour to the California Science Center in Los Angeles. Under the terms of a Space Act Agreement with the science center, NASA will safely transport Endeavour to LAX for a planned arrival on Thursday, September 20. At sunrise on September 17, the SCA and Endeavour will depart Kennedy Space Center's Shuttle Landing Facility in Merritt Island, Florida and perform a flyover of various areas of the Space Coast, including Kennedy Space Center, the Kennedy Space Center Visitor Complex, Cape Canaveral Air Force Station, Cape Canaveral, Merritt Island, Cocoa Beach, and Patrick Air Force Base similar to that of Space Shuttle Discovery's fly-over pictured above. 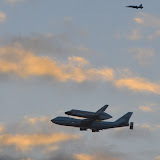 On the morning of Sept. 20, the SCA and Endeavour will take off from Dryden and perform a low-level flyover of northern California, passing near NASA's Ames Research Center at Moffett Field, Calif., and various landmarks in multiple cities, including San Francisco and Sacramento. The aircraft also will conduct a flyover of many Los Angeles sites before landing about 11 a.m. PDT at LAX.